Pretty Purplexing: What A Beach! It's been an annual tradition to buy a puzzle during our beach vacation. 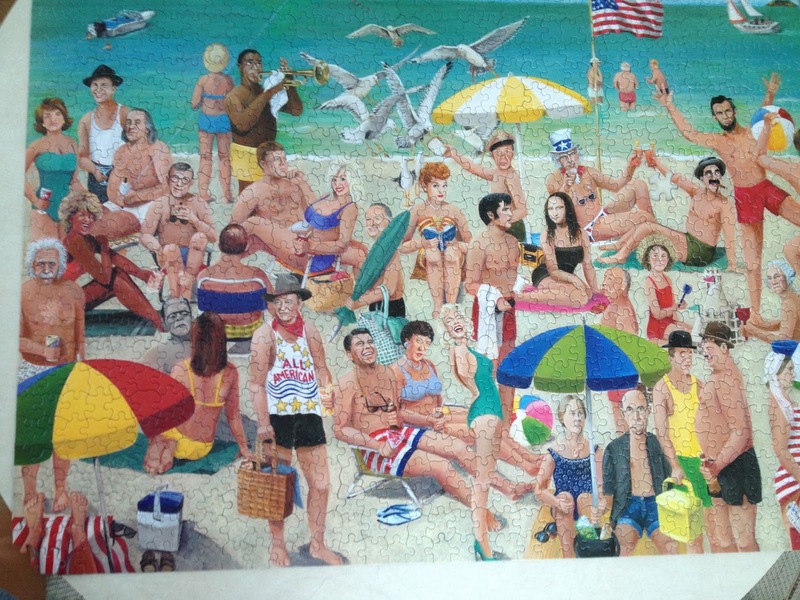 This year we chose a 1,000 piece puzzle: "What A Beach!" by White Mountain. It's something fun for the kids and adults to do. Especially during one rainy day we had. (and a few other famous ones too). How many famous people can you name? That puzzle is so awesome! I saw at least 22 with a quick glance. I see an Einstein, a Marilyn, A JFK, a Louis Armstrong, a Lincoln and so many more. :) This looks like a fun puzzle. I used to love doing them! This looks like a fun puzzle. Uncle Sam is sporting a red/white and blue speedo! Even Frankenstein is at the beach. My favorite is Einstein holding, what looks like to be, a beer. Superman was flying in the sky, but you can't see him because the picture got cut off. I love puzzles. We did them a lot when the boys were younger. Now we just do them at the beach. It's the best one we have done so far. I loved it! Puzzles are great for kids. It gets their brains working and it's fun too! That's cool that you take the puzzles home. I know most of them. There are a few I do not. You'd think the box would tell you who they are. Nope! I don't enjoy puzzles, but that one is great!! me again. just checkin in on you.